The MMLJ Hawkeye Vehicle Tracker has an in-built GPS receiver and a GSM modem that transmits and receives location and configuration commands. This unit provides real time Location of the vehicle within time intervals up to 2 second. The unit receives Latitude and Longitude information from the GPS satellites above. It transmits positional information to the server. The client can now view the position and additional information on a Map in real time. The user can configure the unit using over the Air commands and even optimize the transmission to achieve minimum Airtime costs. 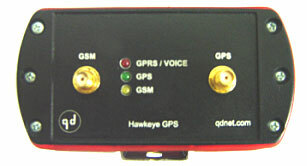 GPS & GSM : Has an in-built multi band GSM modem with GPS receiver. Location information : Provides its location at user programmed intervals. Data Transmission : Transmits its location and additional information using either SMS or GPRS service. The sent and received data is compressed and encrypted during transmissions. Configuration Commands : The unit can be configured using Over the Air Commands (OTA). Data Compression : Supports SMS/GPRS data compression to support various GSM service provider Tariff plans worldwide. Reports : Various reports for Alerts, Daily Movement, Stop, Speed, Distance, Digital status with date and time stamp. Reports are available in MAP, text and Graphical format. Reports can be printed downloaded in Excel compatible CSV formats or emailed. Users : Multiple Users with organizational hierarchy can be created. Computed Odometer reading : Gives Odometer readings based on periodic GPS positions and distance calculated between consecutive positions. Storage Memory : Stores over 20,000 positions along with additional information incase of loss of GSM coverage. Input Voltage : Works from 6V DC to 36V DC. ·	Dimensions: L=110mm B=75mm H=56mm. Transmission Frequency : Dual timing mode support (Movement and stationary) for SMS and GPRS thus helps in reducing airtime, which in turn reduces costs. Can also be configured to transmit based on distance covered. Current Position : Gets the current position of the unit as soon as the command is given. Tracking :Supports location transmission of 4-second time intervals and a maximum up to 4 hours.